Note by Translator: This letter was addressed to a Russian lady who wrote to Tolstoy asking his advice or assistance when the "Literature Committee," Komitet Gramotnosti, in which she was actively engaged, was closed. The circumstances were as follows: A "Voluntary Economic Society" (founded in the reign of Catherine the Great) existed, and was allowed to debate economic problems within certain limits. Its existence was sanctioned by, and it was under the control of, the Ministry of the Interior. A branch of this society was formed called the "Literature Committee." This branch aimed at spreading good and wholesome literature among the people and in the schools, by establishing libraries or in other ways. However, their views as to what books it is good for people to read did not tally with those of the government, and in 1896 it was decreed that the "Voluntary Economic Society" should be transferred from the supervision of the Ministry of the Interior to that of the Ministry of Education. This sounded harmless, but translated into unofficial language it meant that the activity of the Committee was to terminate, and the proceeding of the whole Society was to be reduced to a formality. I should be very glad to join you and your associates  whose work I know and appreciate  in standing up for the rights of the "Literature Committee," and in opposing the, enemies of popular education. But in the sphere in which you are working, I see no way to resist them. My only consolation is that I, too, am constantly engaged in struggling against the same enemies of enlightenment, though in another manner. Concerning the special question with which you are preoccupied, I think that, in place of the "Literature Committee" which has been prohibited, a number of other "Literature Associations," to pursue the same objects, should be formed without consulting the government, and without asking permission from any censor. Let government, if it likes, prosecute these "Literature Associations," punish the members, banish them, etc. If government does that it will merely cause people to attach special importance to good books and to libraries, and it will strengthen the trend toward enlightenment. It seems to me that it is now specially important to do what is right quietly and persistently, not only without asking permission from government, but consciously avoiding its participation. The strength of the government lies in the people's ignorance, and government knows this, and will, therefore, always oppose true enlightenment. It is time we realized that fact. And it is most undesirable to let government, while it is diffusing darkness, pretend it is busy with the enlightenment of the people. It is doing this now, by means of all sorts of pseudo-educational establishments which it controls: schools, high schools, universities, academies, and all kinds of committees and congresses. But good is good, and enlightenment is enlightenment, only when it is quite good and quite enlightened, and not when it is toned down to meet the requirements of Delyanof's or Durnovo's circulars. And I am extremely sorry when I see valuable, disinterested, and self-sacrificing efforts spent unprofitably. Sometimes it seems to me quite comical to see good, wise people spending their strength in a struggle against government, to be maintained on the basis of laws which that very government itself makes just what it likes. There are people (we ourselves are such) who realize that our government is very bad, and who struggle against it. From before the days of Radishchef (1) and the Decembrists (2) there have been two ways of carrying on the struggle; one way is that of Stenka Razin (3), Pugatchef (4), the Decembrists, the Revolutionary party (5) of the years sixty, the Terrorists (6) of the thirteenth of March, and others. The other way is that which is preached and practiced by you  the method of the "Gradualists," which consists in carrying on the struggle without violence and within the limits of the law, conquering constitutional rights bit by bit. Both these methods have been employed unceasingly within my memory for more than half a century, and yet the state of things grows worse and worse. Even such signs of improvement as do show themselves have come, not from either of these kinds of activity, but from causes of which I will speak later on, and in spite of the harm done by these two kinds of activity. Meanwhile, the power against which we struggle grows ever greater, stronger, and more insolent. The last rays of self-government  the zemstvos (local government boards), public trial, your Literature Committee, etc.  are all being done away with. Now that both methods have been ineffectually tried for so long a time, we may, it seems to me, see clearly that neither the one nor the other will do  and why this is so. To me, at least, who have always disliked our government, but have never adopted either of the above methods of resisting it, the defects of both methods are apparent. The first way is unsatisfactory because (even could an attempt to alter the existing regime by violent means succeed) there would be no guarantee that the new organization would be durable, and that the enemies of that new order would not, at some convenient opportunity, triumph by using violence such as has been used against them, as has happened over and over again in France and wherever else there have been revolutions. And so the new order of things, established by violence, would have continually to be supported by violence, i.e. by wrong-doing. And, consequently, it would inevitably and very quickly be vitiated like the order it replaced. And in case of failure, all the violence of the revolutionists only strengthens the order of things they strive against (as has always been the case, in our Russian experience, from Pugatchef's rebellion to the attempt of the thirteenth of March), for it drives the whole crowd of undecided people, who stand wavering between the two parties, into the camp of the conservative and retrograde party. So I think that, guided by both reason and experience, we may boldly say that this means, besides being immoral, is also irrational and ineffective. The other method is, in my opinion, even less effective or rational. It is ineffective and irrational because government, having in its hands the whole power (the army, the administration, the Church, the schools, and police), and framing what are called the laws, on the basis of which the Liberals wish to resist it  this government knows very well what is really dangerous to it, and will never let people who submit to it, and act under its guidance, do anything that will undermine its authority. For instance, take the case before us: a government such as ours (or any other), which rests on the ignorance of the people, will never consent to their being really enlightened. It will sanction all kinds of pseudo-educational organizations, controlled by itself: schools, high schools, universities, academies, and all kinds of committees and congresses and publications sanctioned by the censor  as long as those organizations and publications serve its purpose, i.e. stupefy people, or, at least do not hinder the stupefaction of people. But as soon as those organizations, or publications, attempt to cure that on which the power of government rests, i.e. the blindness of the people, the government will simply, and without rendering account to any one, or saying why it acts so and not otherwise, pronounce its "veto" and will rearrange, or close, the establishments and organizations and will forbid the publications. And therefore, as both reason and experience clearly show, such an illusory, gradual conquest of rights is a self-deception which suits the government admirably, and which it, therefore, is even ready to encourage. But not only is this activity irrational and ineffectual, it is also harmful. It is harmful because enlightened, good, and honest people by entering the ranks of the government give it a moral authority which but for them it would not possess. If the government were made up entirely of that coarse element  the violators, self-seekers, and flatterers  who form its core, it could not continue to exist. The fact that honest and enlightened people are found who participate in the affairs of the government gives government whatever it possesses of moral prestige. That is one evil resulting from the activity of Liberals who participate in the affairs of government, or who come to terms with it. Another evil of such activity is that, in order to secure opportunities to carry on their work, these highly enlightened and honest people have to begin to compromise, and so, little by little, come to consider that, for a good end, one may swerve somewhat from truth in word and deed. For instance, that one may, though not believing in the established Church, go through its ceremonies; may take oaths; and may, when necessary for the success of some affair, present petitions couched in language which is untrue and offensive to man's natural dignity: may enter the army; may take part in a local government which has been stripped of all its powers; may serve as a master or a professor, teaching not what one considers necessary oneself, but what one is told to preach by government; and that one may even become a Zemsky Nachalnik (7), submitting to governmental demands and instructions which violate one's conscience; may edit newspapers and periodicals, remaining silent about what ought to be mentioned, and printing what one is ordered to print; and entering into these compromises  the limits of which cannot be foreseen  enlightened and honest people (who alone could form some barrier to the infringements of human liberty by the government, imperceptibly retreating ever farther and farther from the demands of conscience) fall at last into a position of complete dependency on government. They receive rewards and salaries from it, and, continuing to imagine they are forwarding liberal ideas, they become the humble servants and supporters of the very order against which they set out to fight. It is true that there are also better, sincere people in the Liberal camp, whom the government cannot bribe, and who remain unbought and free from salaries and position. But even these people have been ensnared in the nets spread by government, beat their wings in their cages (as you are no doing with your Committee), unable to advance from the spot they are on. Or else, becoming enraged, they go over to the revolutionary camp; or they shoot themselves, or take to drink, or they abandon the whole struggle in despair, and, oftenest of all, retire into literary activity, in which, yielding to the demands of the censor, they say only what they are allowed to say, and  by that very silence about what is most important  convey to the public distorted views which just suit the government. But they continue to imagine that, they are serving society by the writings which give them the measure of subsistence. Thus, both reflection and experience alike show me that both the means of combating government, heretofore believed in, are not only ineffectual, but actually tend to strengthen the power and the irresponsibility of government. What is to be done? Evidently not what for seventy years past has proved fruitless, and has only produced inverse result. What is to be done? Just what those have done, thanks to whose activity is due that progress toward light and good which has been achieved since the world began, and is sill being achieved today. That is what must be done. And what is it? Merely the simple, quiet, truthful carrying on of what you consider good and needful, quite independently of government, and of whether it likes it or not. In other words: standing up for your rights, not as a member of the Literature Committee, not as a deputy, not as a landowner, not as a merchant, not even as a member of Parliament; but standing up for your rights as a rational and free man, and defending them, not as the rights of local boards or committees are defended, with concessions and compromises, but without any concessions and compromises, in the only way in which moral and human dignity can be defended. Successfully to defend a fortress one has to burn all the houses in the suburbs, and to leave only what is strong and what we intend not to surrender on any account. Only from the basis of this firm stronghold can we conquer all we require. True, the rights of a member of Parliament, or even of a member of a local board, are greater than the rights of a plain man; and it seems as if we could do much by using those rights. But the hitch is that in order to obtain the rights of a member of Parliament, or of a committeeman, one has to abandon part of one's rights as a man. And having abandoned part of one's rights as a man, there is no longer any fixed point of leverage, and one can no longer either conquer or maintain any real right. In order to lift others out of a quagmire one must stand on firm ground oneself, and if, hoping the better to assist others, you go into the quagmire, you will not pull others out, but will yourself sink in. It may be very desirable and useful to get an eight-hour day legalized by Parliament, or to get a liberal program for school libraries sanctioned by your Committee; but if, as a means to this end, a member of Parliament must publicly lift up his hand and lie, lie when taking an oath, by expressing in words respect for what he does not respect; or (in our own case) if, in order to pass most liberal programs, it is necessary to take part in public worship, to be sworn, to wear a uniform, to write mendacious and flattering petitions, and to make speeches of a similar character, etc.  then by doing these things and forgoing our dignity as men, we lose much more than we gain, and by trying to reach one definite aim (which very often is not reached) we deprive ourselves of the possibility of reaching other aims which are of supreme importance. Only people who have something which they will on no account and under no circumstances yield can resist a government and curb it. To have power to resist you must stand on firm ground. And the government knows this very well, and is concerned, above all else, to worm out of men that which will not yield, in other words, the dignity of man. When this wormed out of them, government calmly proceeds to do what it likes, knowing that it will no longer meet any real resistance. A man who consents publicly to swear, pronouncing the degrading and mendacious words of the oath; or submissively to wait several hours, dressed up in a uniform, at a ministry reception; or to inscribe himself as a special constable for the coronation; or to fast and receive communion for respectability's sake; or to ask of the head censor whether he may or may not, express such and such thoughts, etc.  such a man is no longer feared by government. Alexander II said he did not fear the Liberals because he knew they could all be bought, if not with money, then with honors. The government of Alexander III knew this very well, and, knowing it, deliberately destroyed all that the Liberals thought that they had achieved and were so proud of. It altered and limited trial by jury; it abolished the "Judges of the Peace"; it canceled the rights of the universities; it perverted the whole system of instruction in the high schools; it reestablished the cadet corps, and even the state's sale of intoxicants; it established the Zemsky Nachalniks; it legalized flogging; it almost abolished the local government boards (zemstvos); it gave uncontrolled power to the governors of provinces; it encouraged the quartering of troops (eksekutsia) on the peasants in punishment; it increased the practice of "administrative"(8) banishment and imprisonment, and the capital punishment of political offenders; it renewed religious persecutions; it brought to a climax the use of barbarous superstitions; it legalized murder in duels; under the name of a "state of siege" (9) it established lawlessness with capital punishment, as a normal condition of things  and in all this it met with no protest except for one honorable woman (10) who boldly told the government the truth as she saw it. The Liberals whispered among themselves that these things displeased them, but they continued to take part in legal proceedings, and in the local governments, and in the universities, and in government service, and in the press. In the press they hinted at what they were allowed to hint at, and kept silence on matters they had to be silent about, but they printed whatever they were told to print. So that every reader (who was not privy to the whisperings of the editorial rooms), on receiving a liberal paper or magazine, read the announcement of the most cruel and irrational measure unaccompanied by comment or sign of disapproval, sycophantic and flattering addresses to those guilty of enacting these measures, and frequently even praise of the measures themselves. Thus all the dismal activity of the government of Alexander III  destroying whatever good had begun to take root in the days of Alexander II, and striving to turn Russia back to the barbarity of the commencement of this century  all this dismal activity of gallows, rods, persecutions, and stupefaction of the people has become (even in the liberal papers and magazines) the basis of an insane laudation of Alexander III and of his acclamation as a great man and a model of human dignity. This same thing is being continued in the new reign. The young man who succeeded the late Tsar, having no understanding of life, was assured, by the men in power to who it was profitable to say so, that the best way to rule a hundred million people is to do as his father did, i.e. not to ask advice from any one but just to do what comes into one's head, or what the first flatterer about him advises. 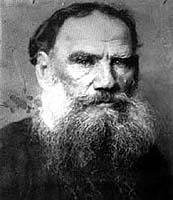 And, fancying that unlimited autocracy is a sacred life-principle of the Russian people, the young man begins to reign; and, instead of asking the representatives of the Russian people to help him with their advice in the task of ruling (about which he, educated in a cavalry regiment, knows nothing, and can know nothing), he rudely and insolently shouts at those representatives of the Russian people who visit him with congratulations, and he calls the desire, timidly expressed by some of them (11), to be allowed to inform the authorities of their needs, "nonsensical fancies." And what followed? Was Russian society shocked? Did enlightened and honest people  the Liberals  express their indignation and repulsion? Did they at least refrain from laudation of this government and from participating in it and encouraging it? Not at all. From that time a specially intense competition in adulation commenced, both of the father and of the son who imitated him. And not a protesting voice was heard, except in one anonymous letter, cautiously expressing disapproval of the young Tsar's conduct. And, from all sides, fulsome and flattering addresses were brought to the Tsar, as well as (for some reason or other) ikons (12), which nobody wanted and which served merely as objects of idolatry to benighted people. An insane expenditure of money, the coronation, amazing in its absurdity, was arranged; the arrogance of the rulers and their contempt of the people caused thousands to perish in a fearful calamity, which was regarded as a slight eclipse of the festivities, which should not terminate on that account (13). An exhibition was organized, which no one wanted except those who organized it, and which cost millions of rubles. In the Chancery of the Holy Synod, with unparalleled effrontery, a new and supremely stupid means of mystifying people was devised, viz., the enshrinement of the incorruptible body of a saint whom nobody knew anything about. The stringency of the censor was increased. Religious persecution was made more severe. The "state of siege," i.e. the legalization of lawlessness, was continued, and the state of things is still becoming worse and worse. And I think that all this would not have happened if those enlightened, honest people, who are now occupied in Liberal activity on the basis of legality, in local governments, in the committees, in censor-ruled literature, etc., had not devoted their energies to the task, of circumventing the government, and, without abandoning the forms it has itself arranged, of finding ways to make it act so as to harm and injure itself (14); but, abstaining from taking any part in government or in a business bound up with government, had merely claimed their rights as men. "You wish, instead of 'Judges of the Peace,' to institute Zemsky Nachalniks with birch rods; that is your business, but we will not go to law before your Zemsky Nachalniks, and will not ourselves accept appointment to such an office: you wish to make trial by jury a mere formality; that is your business, but we will not serve as judges, or as advocates, or jurymen: you wish under the name of a 'state of siege,' to establish despotism; that is your business, but we will not participate in it, and will plainly call the 'state of siege' despotism, and capital punishment inflicted without trial, murder: you wish to organize cadet corps, or classical high schools, in which military exercises and the Orthodox faith are taught; that is your affair, but we will not teach in such schools, or send our children to them, but will educate our children as seems to us right: you decide to reduce the local government boards (zemstvos) to impotence; we will not take part in it: you prohibit the publication of literature that displeases you; you may seize books and punish the printers, but you cannot prevent our speaking and writing, and we shall continue to do so: you demand an oath of allegiance to the Tsar; we will not accede to what is so stupid, false, and degrading: you order us to serve in the army; we will not do so, because wholesale murder is as opposed to our conscience as individual murder, and above all, because the promise to murder whomsoever a commander may tell us to murder is the meanest act a man can commit: you profess a religion which is a thousand years behind the times, with an 'Iberian Mother of God' (15), relics, and coronations; that is your affair, but we do not acknowledge idolatry and superstition to be religion but call them idolatry and superstition, and we try to free people from them." And what can government do against such activity? It can banish or imprison a man for preparing a bomb, or even for printing a proclamation to working-men; it can transfer our "Literature Committee" from one ministry to another, or close a Parliament  but what can a government do, with a man who is not willing publicly to lie with uplifted hand, or who is not willing to send his children to an establishment which he considers bad, or who is not willing to learn to kill people, or is not willing to take part in idolatry, or is not willing to take part in coronations, deputations, an addresses, or who says and writes what he thinks and feel? By prosecuting such a man, government secures for him general sympathy, making him a martyr, and it undermines the foundations on which it is itself built, for in so acting, instead of protecting human rights, it itself infringes them. And it is only necessary for all those good, enlightened, and honest people, whose strength is now wasted in revolutionary, socialistic, or liberal activity, harmful to themselves and to their cause, to begin to act thus, and a nucleus of honest, enlightened, and moral people would form around them, united in the same thoughts and the same feelings; and to this nucleus the ever wavering crowd of average people would at once gravitate, and public opinion  the only power which subdues governments  would become evident, demanding freedom of speech, freedom of conscience, justice, and humanity. And as soon as public opinion was formulated, not only would it be impossible to close the "Literature Committee," but all those inhuman organizations  the "state of siege," the secret police, the censor, Schlusselburg (16), the Holy Synod, and the rest  against which the revolutionists and the liberals are now struggling would disappear of themselves. So that two methods of opposing the government have been tried, both unsuccessfully, and it now remains to try a third and a last method, one not yet tried, but one which, I think, cannot but be successful. Briefly, that means this: that all enlightened and honest people should try to be as good as they can, and not even good in all respects, but only in one; namely, in observing one of the most elementary virtues  to be honest, and not to lie, but to act and speak so that your motives should be intelligible to an affectionate seven-year old-boy; to act so that your boy should not say, "But why, papa, did you say so-and-so, and now you do and say something quite different?" This method seems very weak, and yet I am convinced that it is this method, and this method only, that has moved humanity since the race began. Only because there were straight men, truthful and courageous, who made no concessions that infringed their dignity as men, have all those beneficent revolutions been accomplished of which mankind now have the advantage, from the abolition of torture and slavery up to liberty of speech and of conscience. Nor can this be otherwise, for what conscience (the highest forefeeling man possesses of the truth accessible to him) demands, is always, and in all respects, the activity most fruitful and most necessary for humanity at the given time. Only a man who lives according to his conscience can have influence on people, and only activity that accords with one's conscience can be useful. But I must explain my meaning. To say that the most effectual means of achieving the ends toward which revolutionists and liberals are striving, is by activity in accord with their consciences, does not mean that people can begin to live conscientiously in order to achieve those ends. To begin to live conscientiously on purpose to achieve any external ends is impossible. To live according to one's conscience is possible only as a result of firm and clear religious convictions; the beneficent result of these in our external life will inevitably follow. Therefore the gist of what I wished to say to you is this: that it is unprofitable for good, sincere people to spend their powers of mind and soul in gaining small practical ends; e.g. in the various struggles of nationalities, or parties, or in Liberal wire-pulling, while they have not reached a clear and firm religious perception, i.e. a consciousness of the meaning and purpose of their life. I think that all the powers of soul and of mind of good people, who wish to be of service to men, should be directed to that end. When that is accomplished, all else will be accomplished too. Forgive me for sending you so long a letter, which perhaps you did not at all need, but I have long wished to express my views on this question. I even began a long article about it, but I shall hardly have time to finish it before death comes, and therefore I wished to get at least part of it said. Forgive me if I am in error about anything. (1) Radishchef, the author of "A Journey from Petersburg to Moscow," was a Liberal whose efforts toward the abolition of serfdom displeased the government. He committed suicide in 1802 -TR. (2) The Decembrists were members of the organization which attempted, by-force, to terminate autocratic government in Russia when Nicholas 1 ascended the throne in 1825. -TR. (3) Stenka Razin was a Cossack who raised a formidable insurrection in the seventeenth century. He was eventually defeated and captured, and was executed in Moscow in 1671. -TR. (4) Pugatchef headed the most formidable Russian insurrection of the eighteenth century. He was executed in Moscow in 1775. -TR. (5) The series of reforms, including the abolition of serfdom, which followed the Crimean War and the death of Nicholas 1, were, from the first, adopted half-heartedly. Since about the time of the Polish insurrection (1863) the reactionary party obtained control of the government and has kept it ever since. The more vehement members of the Liberal party, losing hope of constitutional reform, organized a Revolutionary party in the sixties, and later on the Terrorist party was formed, which organized assassinations as a means toward liberty, equality, and fraternity. -TR. (6) Alexander II was killed by a bomb thrown at him in the streets of Petersburg on the thirteenth of March (N.S. ), 1881. This assassination was organized by the Terrorist party. -TR. (8) Sentenced by "Administrative Order" means sentenced by the arbitrary will of government, or the Chief of the Gendarmes of a province. Administrative sentences are often inflicted without the victim being heard in his own defense, or even knowing what acts (real or supposed) have led to his punishment. -TR. (9) The "Statute of Increased Protection," usually translated "state of siege," was first applied to Petersburg and Moscow only, but was subsequently extended to Odessa, Kief, Kharkof, and Warsaw. Under this law the power of capital punishment was entrusted to the governor-generals of the provinces in question. TR. (12) Conventional painting of God, Jesus, Angels, Saints, the mother of God, etc., usually done on bits of wood, with much gilding. They are hung up in the corners of the rooms as well as in churches, etc., to be prayed to. -TR. (13) As part of the coronation festivities a "people's fete" was a ranged to take place on the Khodinskoye Field, near Moscow. Owing to the incredible stupidity of the arrangements, some three thousand people were killed when trying to enter the grounds, besides a large number who were injured. This occurred on Saturday, May 18 (O.S.) 1896. That same evening the emperor danced at the grand ball give by the French ambassador in Moscow. -TR. (15) "The Iberian Mother of God" is a wonder-working ikon of the Virgin Mary which draws a large revenue. It is frequently taken to visit the sick, and travels about with six horses; the attendant priest sits in the carriage bareheaded. The smallest fee charged is six shillings for a visit, but more is usually given. -TR. (16) The most terrible of the places of imprisonment in Petersburg; the Russian Bastille. -TR. The Politics of Obedience: Discourse on Voluntary Servitude (circa 1550), by Etienne de la Boetie, at http://www.blancmange.net/tmh/articles/laboetie.html. Bryan Caplan's bibliographic essay on the literature of nonviolence and civilian-based defense, published by the Institute for Humane Studies at George Mason University, at http://www.humanestudiesreview.org/hsrarchives/s94essay.html.